Pattaya (Thailand) – July 19, 2018 (travelindex) – Best Western Hotels and Resorts has signed a striking new property in Pattaya which reflects the company’s modern style and contemporary vision. Best Western Plus Speech Pattaya Hotel is a brand new project located on Pattaya 3rd Road, in the heart of this popular Thai resort city. Scheduled to open in the fourth quarter of 2019, this downtown hotel will put guests within easy reach of many local attractions, including the Terminal 21 and Central Festival lifestyle malls, Alcazar Cabaret Show and Art in Paradise gallery. Owned by Numchai 2014 Co., Ltd., this eye-catching hotel will feature a modern cubist façade and sleek, stylish and spacious interiors. Soaring ceilings and glass walls will allow natural light to flood into the lobby, presenting a bright and welcoming ambience. The 163 design-led guest rooms will be havens of contemporary comfort and connectivity, equipped with wooden floors, trendy low-slung beds, working desks with international power outlets, mood lighting and complimentary Wi-Fi. 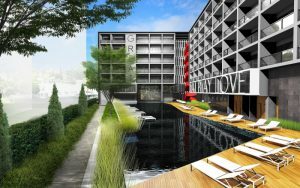 The hotel will also feature a wide range of facilities, providing plenty of opportunities for guests to relax and reconnect with friends, family and colleagues. These include an all-day restaurant specializing in modern Thai and international cuisine, a bright bar for cool daytime drinks and evening cocktails, a state-of-the-art fitness center and a glistening outdoor infinity pool. “Best Western Plus Speech Pattaya Hotel is one of our most exciting projects to date. With its convenient downtown location, cutting-edge design and international facilities, this superb hotel is sure to become a favorite among visitors to Pattaya,” commented Olivier Berrivin, Best Western Hotels & Resorts’ Managing Director of International Operations – Asia. “The vision of Numchai 2014 Co., Ltd., our esteemed partner, is perfectly aligned with Best Western’s strategic outlook in Asia. We are transforming our regional portfolio with the addition of many stunning new hotels and resorts in key destinations. As one of Asia’s most popular beach resorts, Pattaya falls perfectly into this strategy, and I am delighted to continue our rapid regional expansion with such an impressive new property,” Olivier added. According to Mastercard’s Asia Pacific Destinations Index 2017, Pattaya welcomed 8.1 million international visitors last year, which made it the eighth most popular destination in the entire Asia Pacific region. Best Western Plus Speech Pattaya Hotel will be located just a short drive from Bangkok’s Suvarnabhumi Airport and close to the fast-expanding U-Tapao Airport, which now handles more than 1.4 million passengers per year. Best Western has identified Thailand as one of its key target markets. At present, the company operates nine hotels and resorts across the Kingdom, covering five of its 11 brands: Best Western®, Best Western Plus®, Best Western Premier®, BW Premier Collection® by Best Western and SureStay Plus® Hotel by Best Western. But this nationwide portfolio will multiply in future, with plans for hotels and resorts in new destinations like Pattaya, Hua Hin and Chiang Mai, and innovative new brands like Vīb Best WesternSM, the vibrant and modern hotel concept which focuses on convenience, technology and social engagement.